Designed to work with the ClosetMaid Selectives Standard 25 in. Tower Unit, this 10 in. H Decorative Drawer has a fresh white finish and decorative brushed nickel pull for a sleek appearance. Suitable for a wide range of decor, this raised-panel drawer extends fully to give you easy and convenient access to its contents and has ball-bearing glides for smooth and reliable operation. The full-thickness drawer bottom is study and stable, allowing you maximum storage capacity, while the laminate construction ensures long-lasting use. ClosetMaid is a stylish, yet affordable organization solution. The clean, versatile design creates shelving storage in closets and throughout the home. Personalize towers and base units by adding soft-closing drawers. Drawers increase functionality while providing an upgraded look. The melamine finsh also increases durability. The ClosetMaid Impressions 4-Shelf Organizer features 2 fixed shelves and 2 fully adjustable shelves for versatile storage options. This organizer has a premium, embossed chocolate finish and includes additional decorative side and top moldings. Stack 2 units to create a tower or add drawers to create a dresser. The ClosetMaid Impressions Closet Kit features a premium, embossed chocolate finish with a decorative side and top moldings. The organizer features 8 shelves and 3 closet rods that expand from 30 to 48 in. for versatility and to increase the usable space of your reach-in closet. You can add top shelves and drawers to create a custom solution. You can even choose to secure the cabinet to the wall with the included hardware for added safety and stability. The ClosetMaid Impressions Narrow Closet Kit features a premium, embossed walnut finish with a decorative side and top mouldings. The organizer features 8 shelves and 3 closet rods that expand from 30 to 48 in. for versatility and to increase the usable space of your reach-in closet. You can add top shelves and drawers to create a custom solution. You can even choose to secure the cabinet to the wall with the included hardware for added safety and stability. Selectives 23.5-inch x 10-inch Decorative Standard Drawer in White Designed to work with the ClosetMaid Selectives Standard 25 in. Tower Unit, this 10 in. H Decorative Drawer has a fresh white finish and decorative brushed nickel pull for a sleek appearance. Suitable for a wide range of decor, this raised-panel drawer extends fully to give you easy and convenient access to its contents and has ball-bearing glides for smooth and reliable operation. The full-thickness drawer bottom is study and stable, allowing you maximum storage capacity, while the laminate construction ensures long-lasting use. 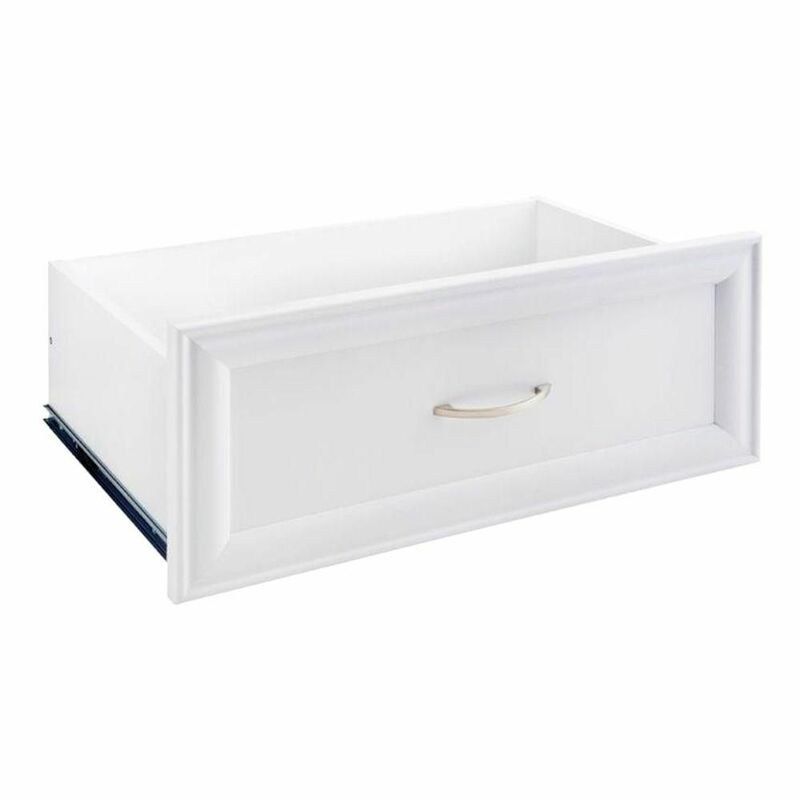 Selectives 23.5-inch x 10-inch Decorative Standard Drawer in White is rated 4.3 out of 5 by 111. Rated 5 out of 5 by DIYCloset from Assembled easily and quickly. Assembled easily and quickly. Rated 5 out of 5 by HomeDepotCustomer from Love the drawers! ... Love the drawers! Rated 5 out of 5 by KennyM from East to assemble. Quality product!... East to assemble. Quality product! Rated 5 out of 5 by Trevor from Bought a couple drawer kits here and was able... Bought a couple drawer kits here and was able to add them to my walk-in closet project.They were Easy to assemble, I ended up adding wood glue to the wooden dowel joints to add Strength.The drawer slides are solid. I did wish they where the soft close style, but they are sturdy! I would buy again! Will this drawer fit my suite symphony closetmaid starter kit? It looks like it will. Absolutely. Just be sure you are using the correct width of drawer for the kit you have. The drawers were easy to assemble and fit like a glove. I'm not particularly handy, but I managed to install an entire closet alone. I'm building custom closets and would like to puchase these drawers. What is the exact &quot;inside&quot; dimension I should create for the tower so these drawers fit with no issues? Do I need to purchase brackets to use this with the ClosetMaid Tower? Or are the brackets included?